Most Americans have a pretty firm idea of where the borders of the United States lie. But most are unaware that the federal government has an entirely different — and alarmingly far-reaching — definition of the nation’s boundaries when it comes to immigration enforcement. In fact, Customs and Border Protection agents have the authority to stop and conduct searches on vehicles within 100 air miles from any external boundary of the United States, including the coast. For a while now, this 100-mile rule has been the focus of the American Civil Liberties Union — for good reason. Consider this: Nearly two out of three Americans (or close to 200 million people) live within 100 miles of the US land and coastal borders, according to the US Census. The ACLU claims border patrol agents routinely violate the rights of innocent people, sometimes acting like this 100-mile zone is Constitution-free. This practice is problematic on many levels, and should be discontinued. Primarily, “pushing the border in” for 100 miles inland creates a waste of resources: The government agency in charge of enforcing immigration in the country’s interior is Immigration and Customs Enforcement, known as ICE. Empowering border agents to operate in the 100-mile zone diverts them from doing their job at the US-Mexico and US-Canada borders. Even more alarming are the potential consequences of this 100-mile zone rule in light of the newly released policy guidelines regarding the use of profiling by federal law enforcement agents. The Department of Justice announced that, while profiling on the basis of race was already illegal for most federal agents when deciding whether to investigate someone, they will no longer be allowed to consider religion, national origin, gender and gender identity, or sexual orientation. 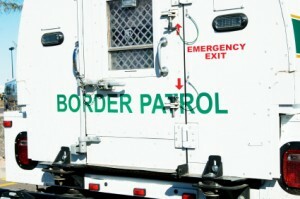 The rule doesn’t cover local or state police departments, and it alsoexempts border agents. This generous exclusion — which Attorney General Eric Holder was opposed to, but was overruled by the White House and the Department of Homeland Security — means that border officials will still be allowed to use profiling when conduct screening and inspection activities near the border. Posted: 1/2/15 at 10:44 AM under News Story.